If you are used to bringing your vehicle to the dealership for repair, service, and maintenance, it’s quite likely you’ll find it to be the most natural solution to bring your car there for transmission repair, too. 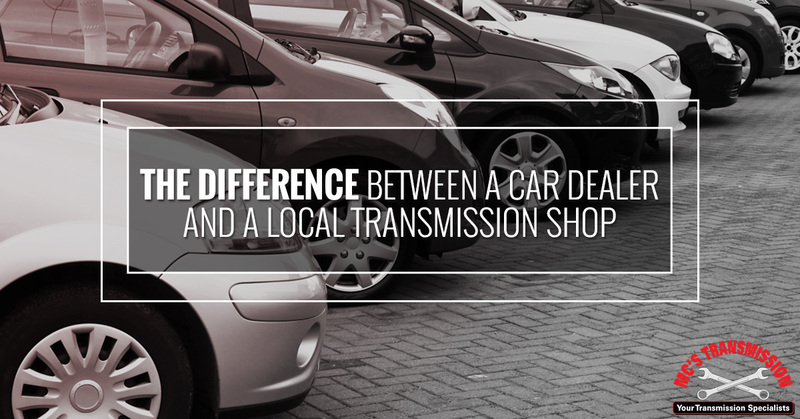 However, there is a difference between a dealership and a transmission specialist when it comes to getting your transmission back up and running, and you should be informed of these key differences before you make your final decision. Here are some points from our transmission shop in Northville, MI, on whether or not your should bring your car to a dealership for transmission repair. One of the top reasons why people bring their vehicle in to the dealership is because it is still covered under warranty. During the warranty period, if you go to a private shop, you may pay more depending on the service or repair that you need. If you would have paid nothing at the dealership, it’s probably worth your while to go there. The only way to know for sure is to call around and get a couple of quotes. Ask your dealer how much they will charge you. If the dealership is going to charge you full price or your vehicle is no longer under warranty, you might want to take it another route because of some of the reasons below. A local shop that specializes in nothing but transmission service and repair is going to be more skilled at giving you an accurate diagnosis and efficient repair. Your dealership may or may not employ a transmission specialist. If they don’t, then the person who is working on your transmission at the dealership is going to be a person who likely hasn’t done that particular job very many times. This increases the likelihood of error and of work that you pay for but that doesn’t solve the problem. A reputable transmission shop like MC’s Transmission is going to approach your transmission repair with all the skill and love of a master craftsman. After all, this is what we have chosen as our life’s work. A car dealer who doesn’t have the resources and expertise on-site to do your transmission job may outsource it to a 3rd party. Since transmissions are complex assemblies, they’re not fun for your dealer to work with. However, if this happens, what you’ll pay is the 3rd party fees plus the dealership’s markup so that they make a profit. Why not just take your transmission directly to a transmission shop where you know that all the work will be performed on-site by the transmission mechanics that you have met? If you think that you’ll get better quality parts from a dealership, think again. Anyone can order the OEM (Original Equipment Manufacturer) parts that your dealer has access to. And any dealer can scam you by installing a used transmission instead of a rebuilt one, putting you at risk of the exact same breakdown occurring in the near future. When you need a rebuilt transmission, repair, service, or diagnosisin Northville and the surrounding areas, count on MC’s Transmission. This family-owned business has been in operation for more than 20 years. Come on in today.